From time to time we have noted in Helm’s Deep the welcome tendency in certain contemporary scholars of Reformed theology to reinstate the idea of the natural. There is a renewed interest in natural law, for example, by writers such as Stephen Grablis and David VanDrunen and others, (even ch. 8 and 12 of John Calvin’s Ideas and ch. 10 of Calvin at the Centre make a modest contribution.) And some have rediscovered the presence of natural theology in the Westminster standards. 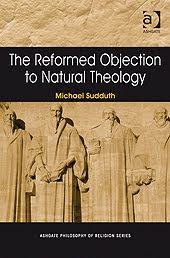 The Reformed Objection to Natural Theology (Ashgate, 2009) by Michael Sudduth, which is written from an avowed Reformed standpoint, may be regarded as being part of that wave. The author may not (perhaps) think of it as such, for the book is completely free of anxieties about, and admiration for, the scepticism and relativism of ‘post-modernity’. For that alone the reader may be heartily thankful. He takes his starting point from the title of a well-known lecture of Alvin Plantinga’s, ‘The Reformed Objection the Natural Theology’ as well as the way in which natural theology has been dismissed and discounted in much twentieth century reformed theology, from Karl Barth and G.C. Berkouwer to Gordon H. Clark and Cornelius Van Til and Robert Reymond. He finds some antecedents of this position in the neo-Calvinism of Herman Bavinck and Abraham Kuyper. I think it is fair to say that Plantinga’s title does not do justice to his own present position regarding natural theology. Sudduth makes a basic distinction between natural religion and natural theology. Natural religion is immediate, intuitive and innate in character, whereas natural theology is discursive and argumentative. Reformed attitudes to natural theology have typically seen them as drawing out the implied features of natural religion. There may be bad natural theological arguments. No doubt there are. But one bad argument does not ruin all the arguments in the barrel. Sudduth is concerned with defending the project of natural theology against objections to it from some in the Reformed orbit, though not supporting every last thing that natural theologians have said. A second distinction is between the knowledge of God and acquiring true beliefs about God. The great merit of Sudduth’s book is its conceptual sophistication; the distinction between natural religion and natural theology is treated in an exemplary way. This is a work both of technical philosophy and of the history of theology, particularly of aspects of the relation between theology and philosophy. He seeks to reinstate natural theology in Reformed Theology after what has been (it is to be hoped) its temporary eclipse through the Barthian-Van Tilian work of the 20th century. His main thesis is that natural theology, discursive argumentation for the existence and nature of God is not inconsistent with the Reformed emphasis of the universality of the sensus divinitatis, nor even of the noetic effects of sin. For the sensus does not exclude natural theology, since the Reformed tradition from Calvin onwards has been it as the articulation of and the filling out and correcting of the results of the sensus. And the noetic effects of sin do not provide a substantive obejction to natural theology, since the Reformed see this as a project of the Christian church, not of 'natural reason', and makes modest claims for it even in apologetics. There is a second issue - the place and function of natural theology in a theological and apologetic system. Since the Enlightenment we have been taught that sound arguments of natural theology are necessary for establishing the rationality of religious belief, belief in the existence of God. Only then is theology proper entitled to get going. But this was never the mainstream Reformed view, even after the Enlightenment, though it found favour with some. Sudduth notes (though he is not the only person to do so) that while natural theology may have an apologetic function it is basically a case of faith seeking understanding. After all it is worth noting that even in Thomas Aquinas, his Five Ways occur in his Summa Theologiae as an integral part of the setting forth of the sum of theology, presupposing the Christian revelation, and not as a necessary prolegomenon to the Christian theological enterprise itself. I think that it is fair to say that the historical evidence presented in the book is considered with the purpose of supporting Sudduth’s trajectory, of defending the integrity of the view of Reformed defenders of natural theology, the main purpose of the book. Nevertheless the historical survey is full of interest to historians of Reformed theology from the sixteenth to the twentieth century, and Sudduth appeals to a wide range of data particularly of the nineteenth century. There are some old favourites, but some new faces too. Sudduth is not simply arguing an historical thesis, being content to set that record straight. But he seeks to vindicate that historical position afresh. To this end it seems to me that his treatment of the relation between Scripture and natural theology is one of the best features in the book. But for others maybe the best part of the book will be the Part on The Logic of Theistic Arguments. Here the author discusses the objection that the proofs deliver only the God of the philosophers, not the God of Abraham, Isaac and Jacob. He has no difficulty in demonstrating that such theology may pick out essential features of the living God while not others; they may refer to the true God while not telling us all that Scripture says about him. where Sudduth discusses various Reformed objections to the very idea at length. What is interesting about this I that luminaires of yesteryear such as Gordon H. Clark, Edward J Carnell and Van Til employ the sceptical arguments of Hume and Kant to argue that because certain arguments are not formally valid they are of no use. They are of use, argues Sudduth, in the case where one is attempting to provide a cumulative for the reasonableness of theism. I was pleased to see that in Sudduth’s estimation my old friend Charles Hodge was among those who used them in this very way. In fact, I think that it is fair to aay that Charlie gets a pretty clean sheet from Sudduth when it comes to understanding the nature and place of such arguments in theology and apologetics. (Incidentally, the book is notably free of any of the usual stuff about the influence of the Enlightenment on Hodge and co. though the influence of the Enlightenment is noted from time to time). No doubt Sudduth has not written the last word on this topic. But it is hard to see how any one writing on it in future can fail to benefit from what he has provided here.